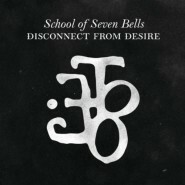 The NYC band School of Sev­en Bells, found­ed in 2007 by Ben­jamin Cur­tis and twin sis­ters Ale­jan­dra and Clau­dia Deheza, released their sec­ond album, Dis­con­nect from Desire, on Tues­day. The band com­bines ele­ments of pop and indie with elec­tron­ic ambiance, com­bin­ing the styles of the mem­bers’ pre­vi­ous bands to form a new sound. Unfor­tu­nate­ly, this sound is less than cre­ative, a prob­lem which, when com­bined with a num­ber of flaws in var­i­ous aspects of Dis­con­nect from Desire, leaves the album quite weak. At its best, Dis­con­nect from Desire’s instru­men­tals are some­what cre­ative. This, of course, is not a com­pli­ment. Though there are occa­sion­al­ly fair­ly inter­est­ing themes and melodies, the chord pro­gres­sions (or lack there­of) con­sis­tent­ly fail to impress, and the end result is that, though still not exact­ly gener­ic-sound­ing, the album man­ages to nev­er sound the slight­est bit unique. The best track of the album is most like­ly “Camar­il­la,” but the song is still long, very sim­i­lar to the rest of the album, and, in short, bor­ing. It can be said that the tracks of Dis­con­nect from Desire blend into each oth­er well. Unfor­tu­nate­ly, that’s not great for the album in this case. More accu­rate­ly, all the tracks sound extreme­ly sim­i­lar, which, com­bined with the smooth, repeat­ed, dreamy sounds, only results in doz­ing lis­ten­ers. The waft­ing sound may be more excus­able on “ILU,” where Deheza actu­al­ly sings about dreams, but the instru­men­tals can’t just match the lyrics. They also have to be, to put it blunt­ly, good. The most remark­able thing about Dis­con­nect from Desire is in how con­sis­tent­ly and effec­tive­ly the band man­ages to take already long tracks (the aver­age track length is right about 5 min­utes) and make them sound even longer. Ale­jan­dra Deheza pro­vides vocals for School of Sev­en Bells, stick­ing to an ethe­re­al, near-dis­em­bod­ied style of singing. While this style of vocals would seem to fit quite well with the album’s instru­men­tal approach, there’s very lit­tle vari­ety in Deheza’s tone across the album, except for occa­sion­al super­flu­ous use of effects, which do less to dis­tin­guish the sec­tions in which they appear than to ful­fill the appar­ent require­ment that all mediocre elec­tron­ic-influ­enced albums must use at least one. It also doesn’t help that the album’s vocals, rather than act­ing as a chang­ing ele­ment of the music, seem to sit some­where around the cen­ter of the instru­men­tals, nev­er both­er­ing to move. Lyri­cal­ly, Dis­con­nect from Desire is not remark­able. What is remark­able, how­ev­er, is the lev­el of rep­e­ti­tion. In what is per­haps the worst exam­ple, “Wind­storm,” with the excep­tion of the first stan­za and a very short inter­lude, is com­posed entire­ly of two lines, repeat­ed over and over. When the album’s not doing that, it man­ages to be as gener­i­cal­ly abstract as pos­si­ble, with lines like “I felt my heart faint­ing with­in.” Nei­ther approach inspires much excite­ment or dis­plays much, if any, cre­ativ­i­ty. Dis­con­nect from Desire is a very lengthy-sound­ing album at only 50 min­utes, almost entire­ly devoid of any­thing inter­est­ing what­so­ev­er, and not all that fun to lis­ten to either. A few of the tracks try to be catchy, and invari­ably end up not, and if the sound was sup­posed to be art­sy, well, it’s about as inter­est­ing to lis­ten to as a blank can­vas is to stare at. The album isn’t com­plete­ly awful, but noth­ing stands out that might redeem it for more than half a track.